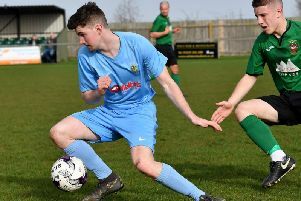 Saturday saw second-placed FC GNG visit Kilsby Lane for the first time. Borough were already on top after 15 minutes, Brandon Oddy making a curling effort just over the bar from outside the box. Jamie Paye then volleyed straight at the keeper from a curling cross. GNG were reduced to ten men in the 44th minute when their right back pulled back Paye as he tried to latch onto a through ball. Borough punished GNG from the free kick, with Josh Turton scoring after the keeper had already saved Ollie Chater’s ball. Borough started the second half well, creating several more chances on goal; Tom Glasscoe and Ollie Chater both getting close to extending Borough’s 1-0 lead. Kane Finney then shot from 35 yards, which the visiting keeper just managed to tip over the bar. GNG conceded an own goal after a scramble in the goalmouth at the 75th minute and Borough wrapped the game up in the 83rd minute with Chater scoring a superb goal from a Paye pass. Thurnby Rangers still head the table on 30 points from 13 games, with GNG second on 28 from 11 and Rugby Borough just a point behind in third on 27, also from 11 outings.